Cricket is a unifier and the film stars have realised this. The Celebrity Cricket League (CCL), the stars believe, is a perfect platform to reunite the Indian film industry. The second edition of CCL, which kick starts in Sharjah on January 13 with a match between Mumbai Heroes and Telugu Warriors, will also travel to Kochi this season. Last season the league had four teams. This year the competition turns tougher with the entry of Kerala Strikers and Bengal Tigers. The Kerala side is promoted by Mohanlal, who will also lead the side, Lissie Priyadarshan and Shaji P.M. and Bengal Tigers, is owned by filmmaker Boney Kapoor and actress-wife Sridevi. 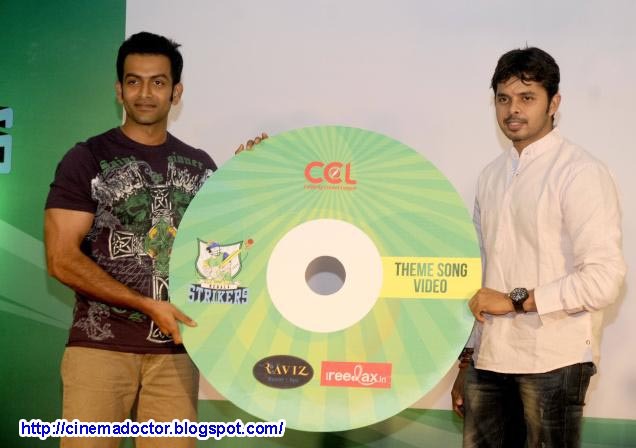 The signature video of Kerala Strikers was launched by Prithviraj and Sreesanth at a function held in the city recently. The music video is by A. L. Vijay that has lyrics by G. S. Arun and pulsating music by Sanjeev Thomas. The official website (www.cclt20.in) was also unveiled by actor-producer Thyagarajan. The Kerala side will include a bunch of young actors like Indrajit, Prthiviraj, Kunchacko Boban, Saiju Kurup, Bala, Vinu Mohan, Asif Ali, Rajiv Pillai, Riyaz Khan, Unni Mukundan etc. Former cricketers D. Chandrasenan Nair and Sunil are the team's coach and assistant coach respectively. Edavela Babu, secretary AMMA, is the manager. The CCL is expected to rope in teams from the Punjab, Marathi, Bhojpuri and Gujarati film industry in the coming years. “This is a great platform for bringing together directors, producers and actors. This will open new opportunities for our young actors,” said Edavela Babu. Kerala Strikers make their CCL debut on January 21 against Chennai Rhinos at Hyderabad. On January 22, two matches will be played at the Jawaharlal Nehru Stadium. Bengal Tigers will play Chennai Rhinos and Kerala Strikers take on Mumbai Heroes. The tournament played on Twenty20 format has six teams: Mumbai Heroes, Chennai Rhinos, Telugu Warriors, Karnataka Bulldozers, Kerala Strikers and Bengal Tigers.